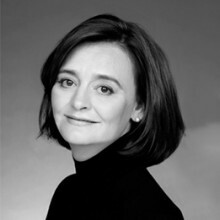 Cherie Blair CBE, QC is the Founder and Chair of Omnia Strategy LLP, a pioneering international law firm that provides strategic counsel to governments, corporate and private clients. Cherie is a Queen’s Counsel and wife of former British Prime Minister Tony Blair. With over 35 years’ experience specialising in public international law, human rights and dispute resolution, Cherie has represented over 30 States as well as numerous multinational corporations. Through Omnia Strategy, Cherie also advises on issues relating to Global Corporate Citizenship with a particular focus on Corporate Social Responsibility and Human Rights in Business. Cherie is the Founder and Patron of the Cherie Blair Foundation for Women, a charity that provides programmes for women entrepreneurs in developing and transition countries. Having studied law at the London School of Economics, Cherie was appointed Queen’s Counsel (QC) in 1995. Cherie has appeared in the European Court of Justice and in multiple Commonwealth jurisdictions, she sits as arbitrator and also lectures internationally.